Smart wearables have definitely gotten a long way in the last year or so, but, the new class of devices is still frantically searching for an identity and comfy place in the consumer’s lives. A definite testament to this fact is the numerous and sometimes strange concepts that have appeared in some smartwatches of late. Like the integrated camera on the Samsung Galaxy Gear 2 or cellular connectivity and sometimes even LTE. But, this all seems to fade in comparison to what Lenovo showcased at the Tech World show in Beijing. 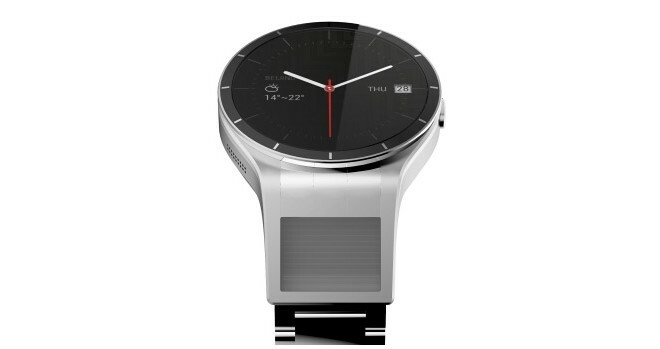 The company’s latest smartwatch concept is dubbed Magic View and, at first glance bears a striking resemblance to the Moto 360, which is only natural. It does, however, have one quite distinctive feature – a second display on the bezel facing the user. The concept behind the extra screen real estate is to provide a way to view detailed rich media content like maps. Photos and videos, which is kind of clunky on a small, round display. The thing is, however, that the second screen is even smaller. Actually, it is not a conventional display, but rather a projection surface that uses “optical reflection”, which Lenovo claims is the key to perceiving a lot bigger images from the limited area. This sounds kind of far-fetched, but, we’ll just have to give the technology the benefit of a doubt, at least until we have more info on the watch. The second pitch for the extra screen, however, does make slightly more sense. The idea is that the screen is pretty personal and can thus be used for private notifications and content. This sounds pretty good, but there is no getting around the fact that to actually use the Magic View you have to hold the watch in front of your face in an incredibly awkward manner. Swiping your watch is one thing, talking to it quite another, but holding it a few centimeters from your face has to take the cake for the most socially-awkward thing you can do. As far as we currently know, the watch, or at least the prototype, showcased on stage, does run on Android, but its not Wear, but rather a custom build. We’ll just have to see if the idea catches on, although, frankly, we don’t see much future in it outside of concept gadgets.